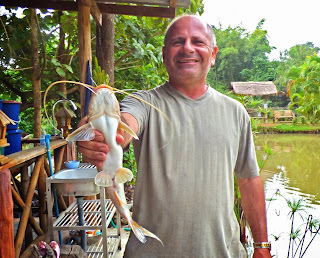 Fishing In Thailand ....And One or Two Other Countries Too! : Records Tumble at Pai Piranha Fishing Park! The hot breaking news out of Northern Thailand is that we broke not one or three or four Lake Records at Pai Piranha but TWO!!!! 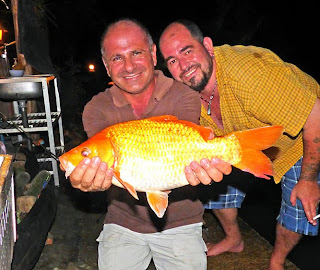 Yes, it's true, Chris Allnatt, your humble correspondent caught a 2.5 Kilogram (about 400lbs) Orange Common Carp which broke the record by 100 grams (or 10 pints). This happened on Tuesday but I wanted to keep quiet about it because I was afraid that world-wide fame would got to my head. I did not need to worry, though...the fame DID go to my head but felt good. Not to be outdone, today, 24th October 2013, my wife Ciela broke the Pai Piranha Fishing Park record for the Bocorts River Catfish...she didn't just break it, she SMASHED the record by 25 percent! The old record was 400 grams, her fish slammed the scales down at 500 grams which is nearly 1 metric ton! Below please find video and photos of this record-breaking couple's stunning feats of skill and sheer luck. My wife's record Bocorts River Catfish. Video was shot by her because NO WAY she was going to hold it! A still photo showing the record Bocort's River Catfish. The Record Board at Pai Piranha....just look for the name "Ciela" for firm and irrefutable proof of her spectacular fishing prowess. Bait used was sweetcorn in case any of you out there want to try and better her record. 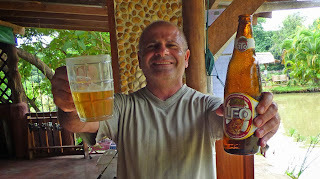 My wife doesn't drink (any more) and the prize for catching a record fish at Pai Piranha is a large beer which you have to consume. Good job I came along to Thailand with her otherwise she'd be in some serious trouble with the park owner! This photo was taken at about 9:30am which is not setting a good example for young fans of this Blog. 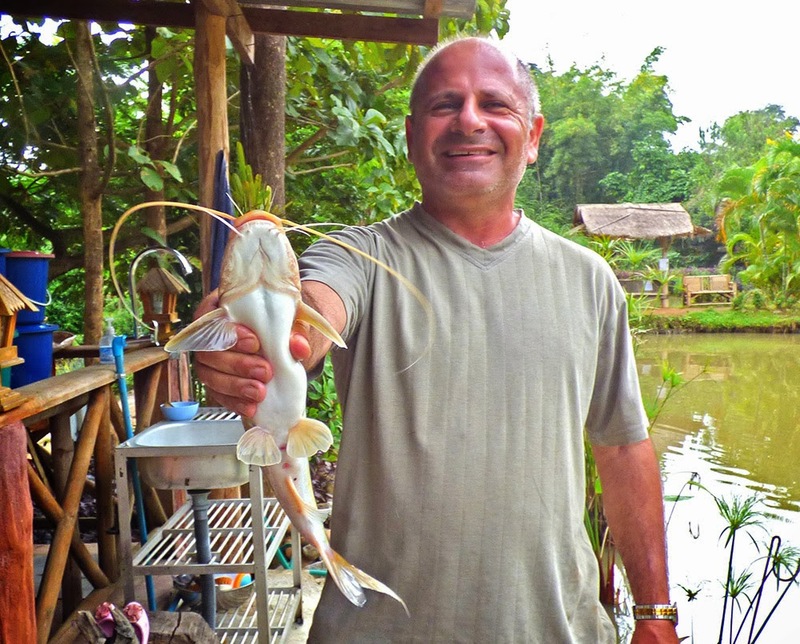 Dave Fox, proud owner of Pai Piranha Fishing Park, Pai, Northern Thailand, looking in awe at me and my RECORD BREAKING GOLDFISH Orange Golden Carp. More proof, for those doubters amongst you.